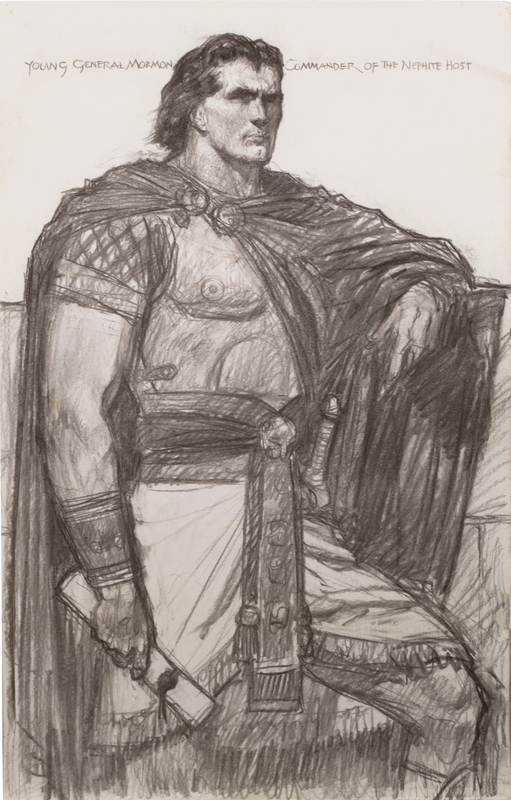 Book of Mormon Central / Archive / Sketch of "Young General Mormon, Commander of the Nephite Host"
Title Sketch of "Young General Mormon, Commander of the Nephite Host"
23 x 14 1⁄2 in. Most often thought of as the compiler of the book that bears his name, Mormon is rarely discussed as a military leader. According to the second chapter in the book of Mormon, at the young age of sixteen, Mormon was chosen as the supreme commander or general of all the Nephite armies. According to his record, this included tens of thousands of soldiers fighting hopeless battles against the even more numerous Lamanites. General Mormon used his position as a military leader to preach to the Nephites, who were ultimately and lamentably unreceptive to his counsels. In this and other depictions of military leaders, Friberg borrows from Imperial Roman statuary, such as this widely produced copy of ancient statue of Julius Caesar as emperor. Like Caesar, Mormon wears a cuirass (i.e., breastplate) and paludamentum (i.e., short military cloak). He holds a sealed scroll, perhaps as a reference to the many letters he wrote to his son, as recorded in the book of Moroni.